This is such great new Melissa. I cannot wait to read the book! Yippie. Congrats to you! hi melissa, ‘clink’ goes that overburdened amazon basket 😉 congratulations – i can’t honestly think of any other person whose travelling lunchbox i want to read more about! Congratulations! How exciting it must be to see your name in "lights!" Bravo! you must be on cloud nine……….how exciting for you! Yay, Melissa! Isn’t it a fun experience to see it all there in black and white?I’ve seen a lot of TT books come off the press, but I think this one is the prettiest yet. I had so much fun opening up my package and perusing the buffet. I loved your story and am looking forward to reading through all the rest–and to cooking them as well. It’s a delight to be book-buddies with you–here’s to many more Melissa bylines! Wow, congratulations! What a thrill! And very deserving too. 🙂 I love the premise of this cookbook, am going to get my hands on a copy soon. Congratulations, Melissa! Will there be a piece in Food&Travel soon, too? PS I’ll add my five suggestions to your Foodblogger’s Guide to the Globe later this week, when I’m back in Edinburgh. 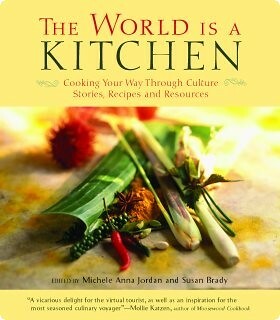 Congratulations!I’ll buy this book that I suspect to be a "bible"for travelers and foodbloggers! How exciting! I keep meaning to write up my 5 Things to Eat Before You Die but it’s so hard! I can’t decide whether I should include single foods, complicated dishes, or experience based indulgences… no matter how many times I try to scale it down, my list always exceeds just 5 items. Congratulations! I will look for the book! Congratulations Melissa! This is going on my to-buy list! YOUAREAMAZING!That’s about all I can say. Melissa – I am so glad you finally received your copy and that it appears to have been worth the wait. I appreciate your contribution, your enthusiasm, and your kind words about the book. It was such a delight to work on, and it is authors like you that make my job as an editor so worthwhile and gratifying. Here’s hoping that we can collaborate again sometime! I agree, there’s nothing cooler than seeing your work on paper bound between two hard covers. Congrats! I’ll definitely be buying this. And thanks for starting the most amazing meme. It has been a true joy seeing everyone’s choices. So much food to try! Thrilling…I’m looking forward to reading this one. good for you! Food is the spice of life. It is just wonderful to see how your writing can contribute to the cheer delight of good eating. Bravo!